Andy Campbell | Wealth Strategies, Inc.
Andy Campbell joined Wealth Strategies in February, 2015. Andy grew up in Hartford City, IN, and attended Blackford High School. 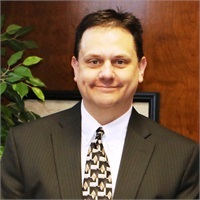 He graduated from Ball State University in 1994 with a Bachelor of Science degree in Management and in 2004 with his Masters of Business Administration (MBA). He spent the early years of his career developing accounting software for small businesses before joining a software firm where he spent time as a programmer and a manager of client services. Andy has obtained his Series 7, Series 66, and insurance licenses and enjoys helping clients achieve their financial goals. Andy lives in Muncie with his wife, Angie, and their two children, Sam and Sophie. He enjoys attending and serving his church, The Compass Church, and has coached several of his children’s soccer, baseball, and basketball teams. Andy enjoys playing golf, reading, watching Ohio State football, and spending time with family and friends.